It’s Queen’s Birthday weekend even here in the Republic of Northcote, so we marked the occasion as fits a monarch by waging some war. 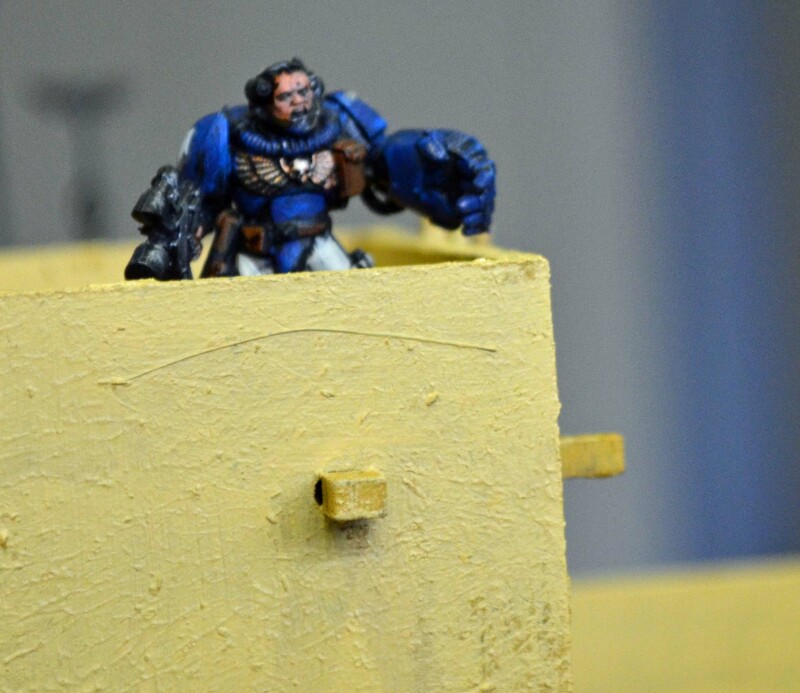 James, Cam, Steef and I got together for some 40K. 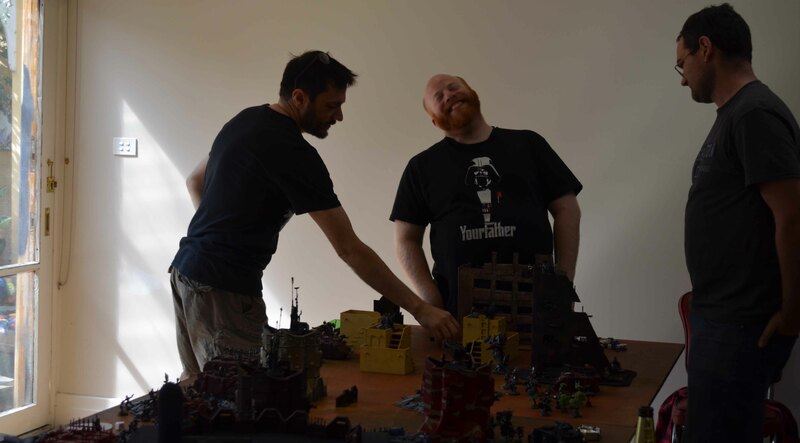 James and I gave the current Space Marine codex a last outing against a joint chaos incursion by Cam using Nurgle marines and Steef who tried out Khorne Daemonkin. We used 3,000 points a side, with Dawn of War deployment and the maelstrom of war mission Deadlock, where the maximum number of tactical cards reduces each turn, starting from six cards per side. We placed the six objectives evenly along the table. Imperial won the toss but let Chaos set up first. Knowing they were most likely to just charge across the table at us we wanted a chance to set up some clear lines of fire. A plan that went awry right from the start as Khorne bikers arrived in our face on turn one. 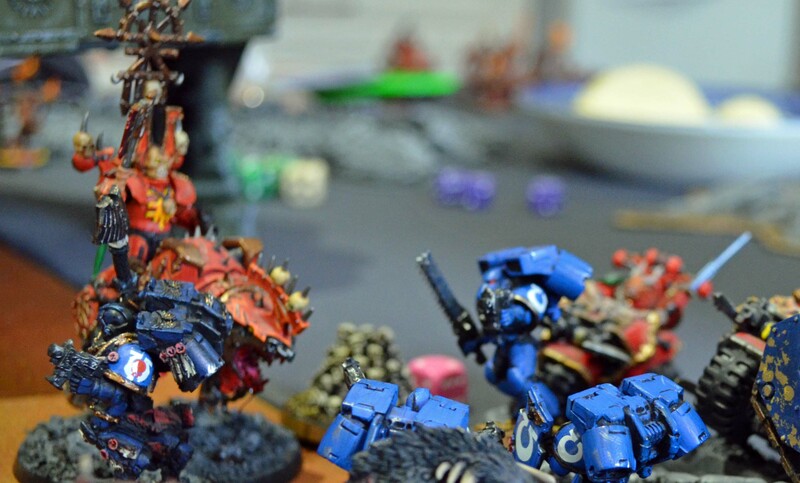 Chaos hounds and bikers, along with the a Khorne lord on a juggernaught were all in combat in the first two turns, with charge and counter-charge defining this flank for the rest of the game. The Imperials held this flank, at some cost, but beyond a victory point for slay the war lord, there were no points to be won. Chaos dominated the other flank. 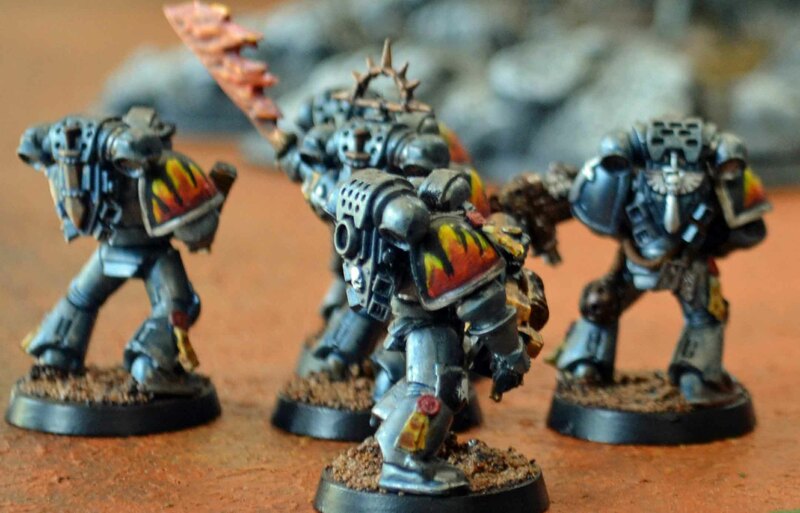 With plenty of big toys, including a very nice looking hell chicken, they slapped down, burnt and generally stomped on every loyal marine in the vicinity. The centre was tough. This was the key for the loyalists if they were to achieve their objectives and the Exorcists threw in all they had. Despite the carnage, Chaos held on and the Space Marine attack bogged down to contest but not seize the objectives in the centre. Imperial strategists cut their losses, leaving Chaos to win 12 VP to 6. So it appears that Chaos has returned to the offensive. Faith and Steel recommend that your emergency plans are current and to standby for further orders. 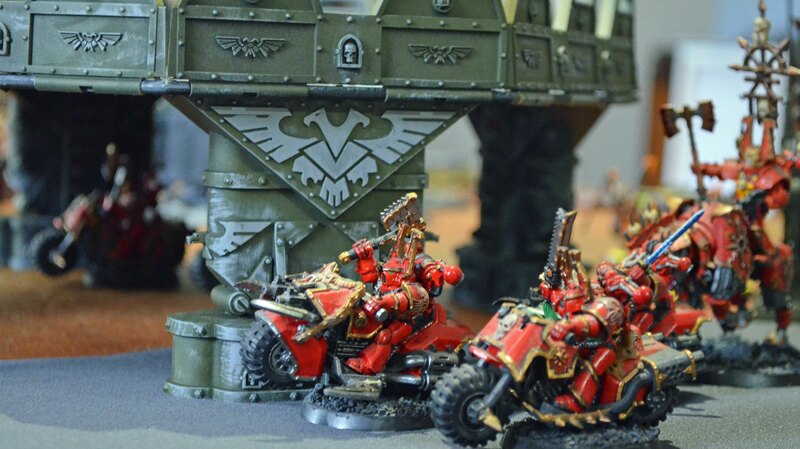 Citizens rejoice, the minions of chaos have been given a bloody nose as loyal soldiers of the Imperium have go over to the offensive. 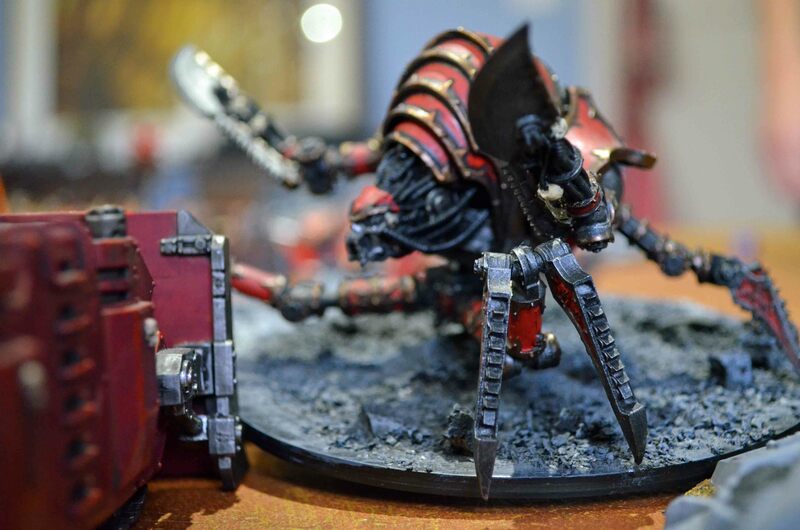 A combined arms attachment have defeated a daemon incursion bought about by the foul rites of a traitor marine coven and their damned followers. 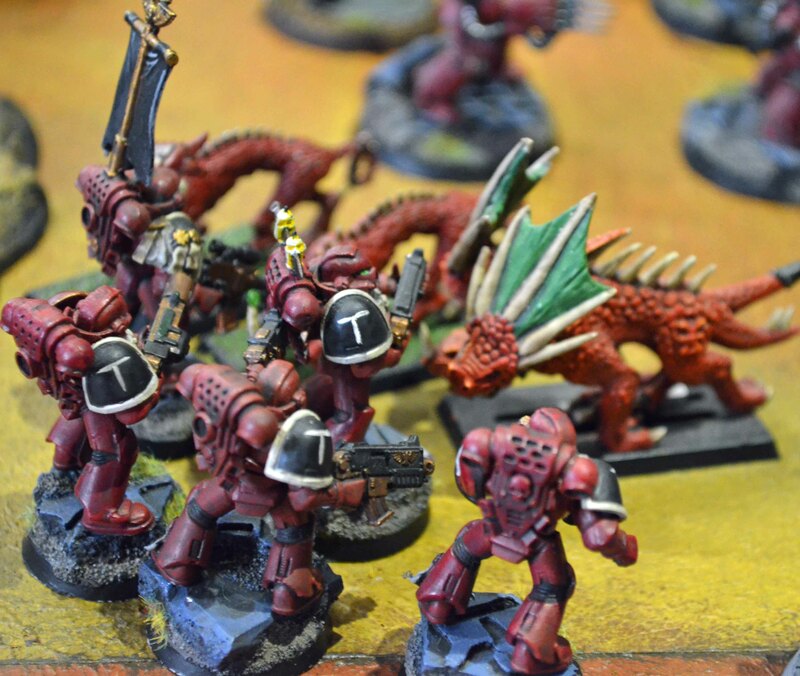 James and Rob bought over a bunch of toys and we played 3,000 points a side of 40K. We set up on long table edges with six objectives and played with the maelstrom of war tactical cards, three per side. 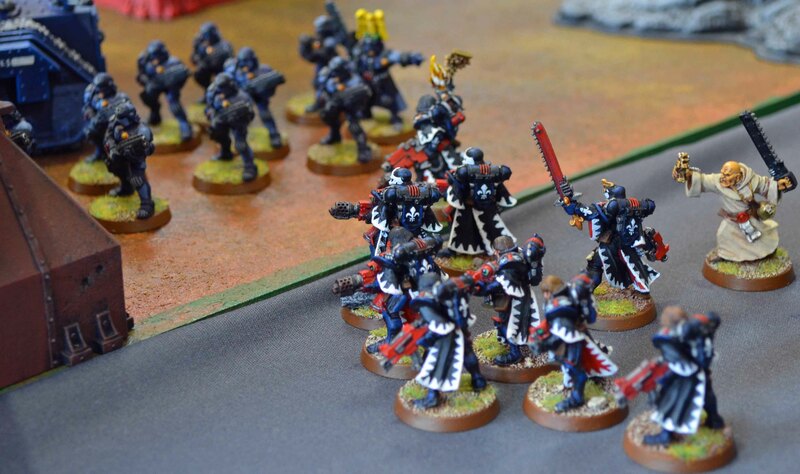 James had his Grey Knights, assisted by Exorcists and an Inquisitor. 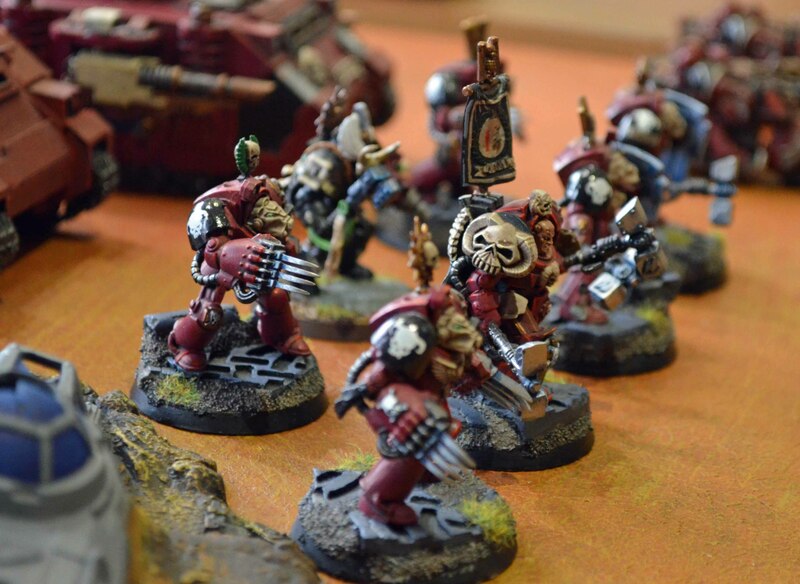 Rob had Guard, Sisters and Marines – so pretty much every loyal faction was represented. 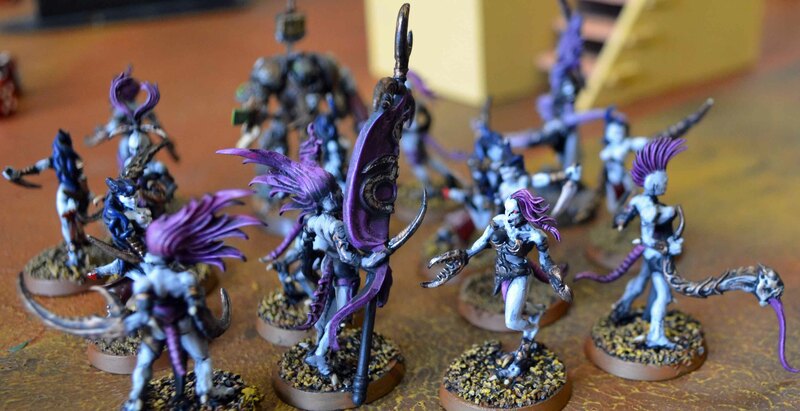 Opposing them were Chaos Space Marines and Slaanesh Daemons. 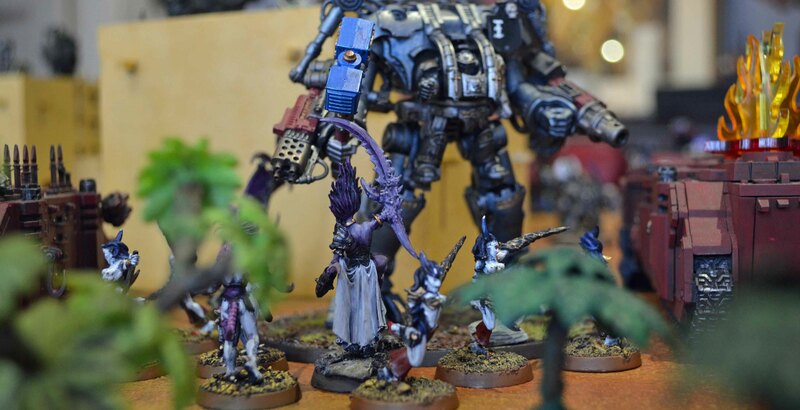 Having had a narrow win in a bruising encounter against the Grey Knights last time we met I was quietly confident. 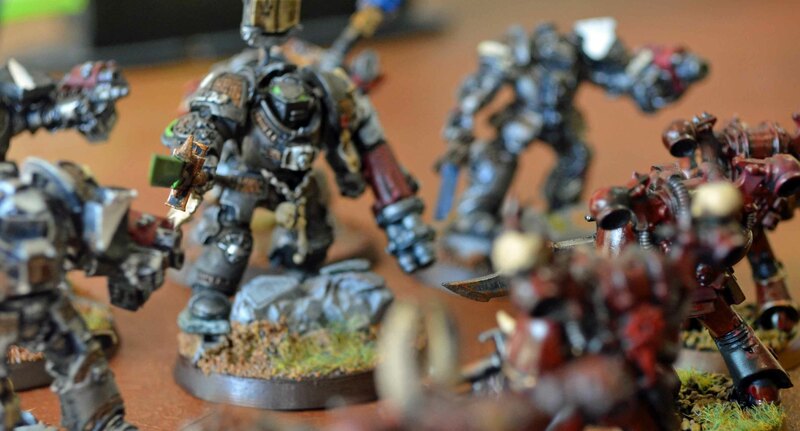 After all I had a bunch of terminators ready to deep strike and three vindicators. What could possibly go wrong? Quite a bit, it turns out. 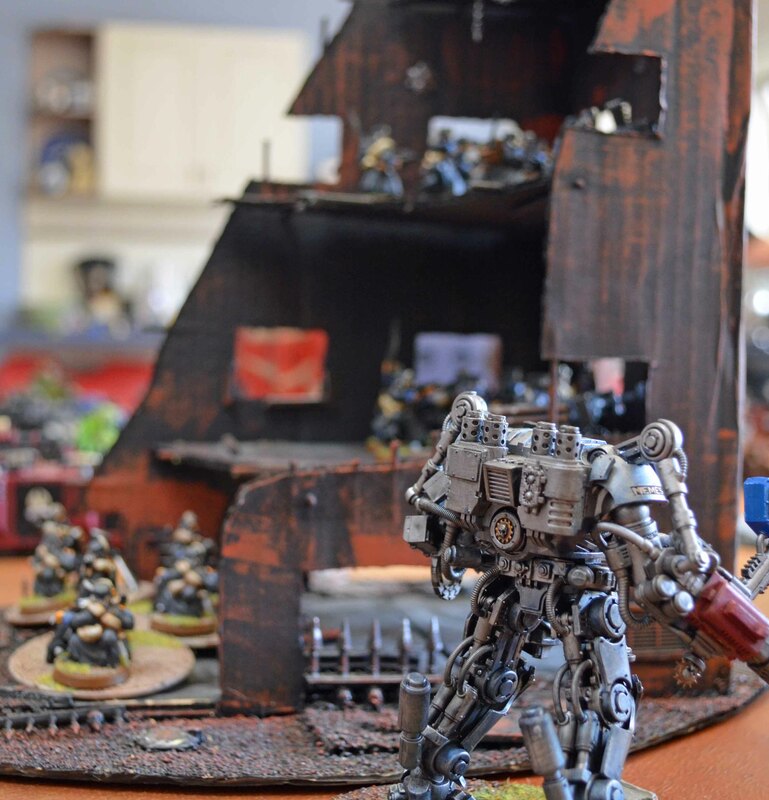 Did you know that Grey Knights can deep strike on turn one? The eviserator wielding priest is close to MVP for mine. 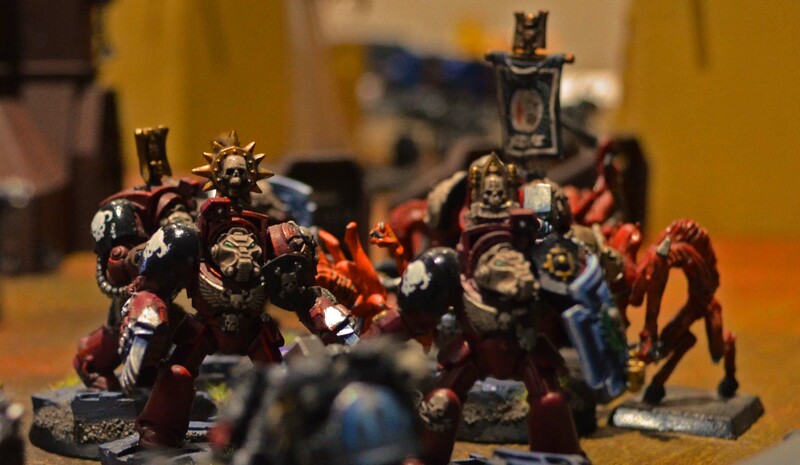 He tore up some Noise Marines, a couple of Word Bearers and a Vindicator. Not a bad day’s work for the frothing chap. Back on the other wing things didn’t get any better. 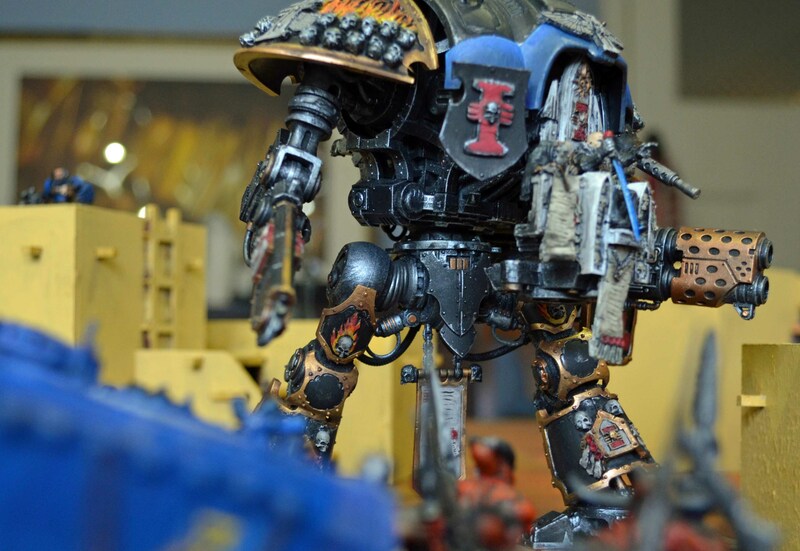 While I was dealing with the Grey Knight terminators a dread knight showed up and, while it took several turns, stomped on the remaining daemonettes. The cultists did well by their drug addled standards. After milling about in some mud-filled craters they successfully charged a unit of Legion of the Damned and went on to seize an objective! Too little too late to change the outcome, however. The final margin can be judged by the height of the two piles. A clear victory to the Imperium. The changing situation bought on by the tactical cards really can bring a game to life. I still like missions with clear objectives but the fluidity required to win with the tactical cards brings a fun level of chaos and some genuine generalship challenges to a game as you seek to exploit the hand you’re dealt. So on a beautiful, sunny day in the Republic of Northcote it was a pleasure to be inside playing dollies. Army lists for Arcanacon are due in a couple of weeks so it’s time to start thinking about what to take. Before Christmas I was all set to take Ultramarines. The list doesn’t need any work, I know the kit and it is a balanced combined-arms force. So, in a near re-run of last year, I’m going to take Chaos. By using Arc bound I get an extra 10 points and I need all the help I can get. Minimum upgrades is because I inevitably get to the end of a game and find I’ve been playing with a self-imposed handicap by ignoring up to 100 points of goodies. This is not a good look. So WYSIWYG and not too many extras to remember will help make things cruisy. This can be particularly important on day 2, especially if the weather is hot. 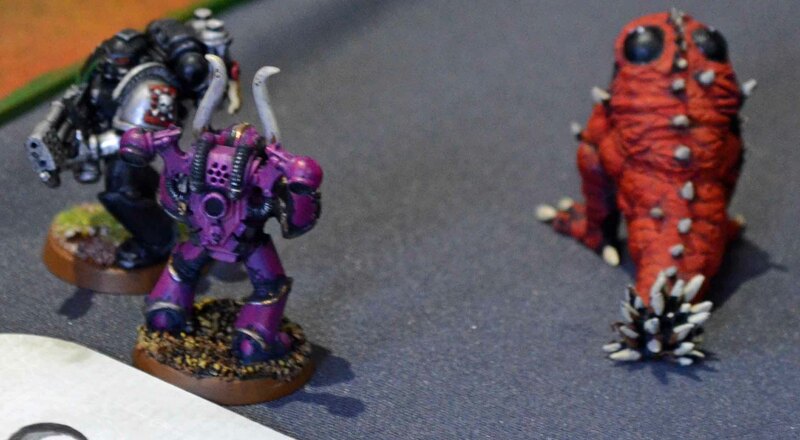 The Apostate found the Sorcerer’s commitment to a single Chaos deity somewhat distasteful, but the Word Bearer needed him for the moment. 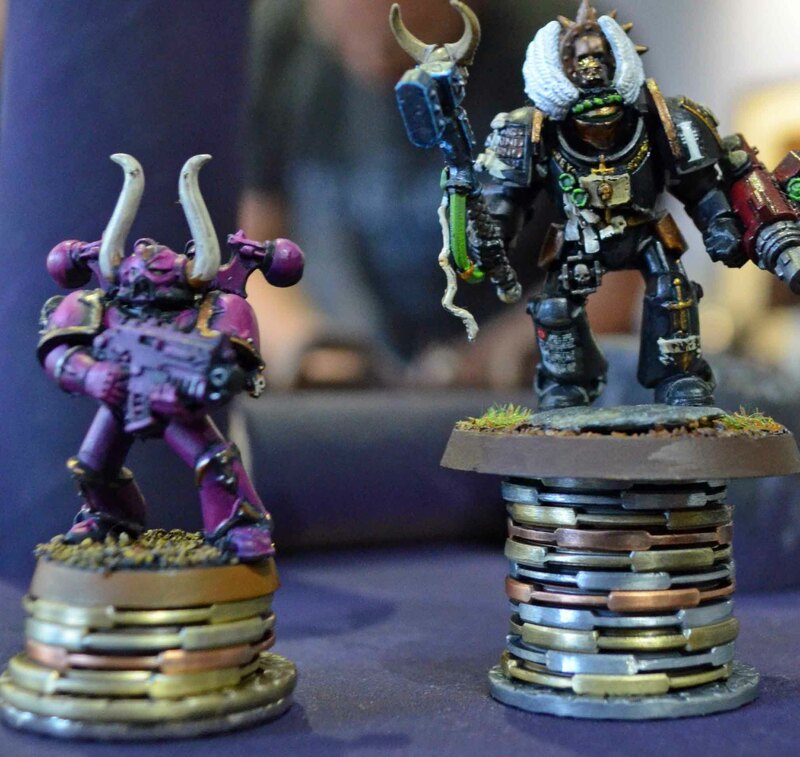 The Slaneeshi sorcerer had promised to teach the Word Bearer some of his warp knowledge and in return the Dark Apostle has for the moment bound his war band to walk the path of excess. The sorcerer is the only model I need to paint. This is a plus. No daemonettes, but given the slap allies recieve in comp I’ve tried to keep the Slaneesh vibe by using the noise marines. There are two things I don’t like about this list. 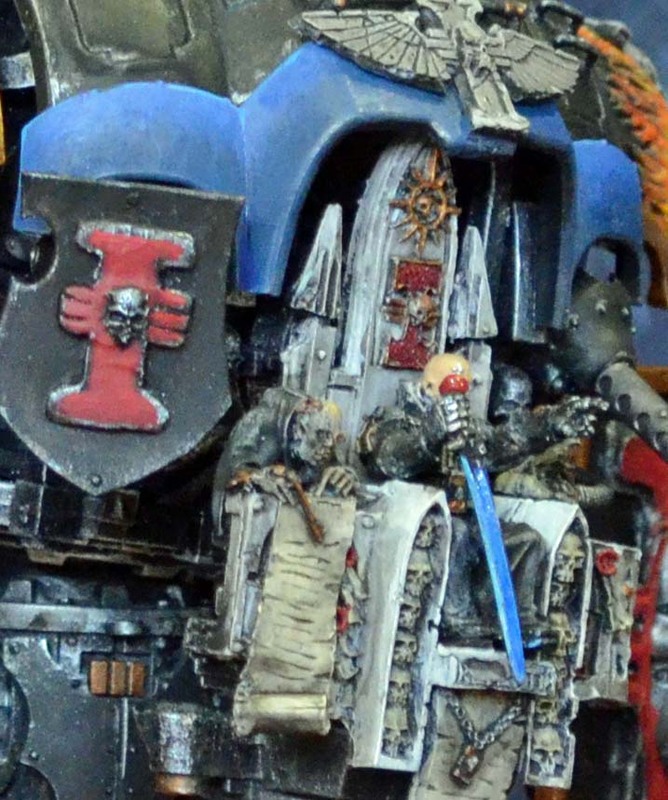 I’ve made the Sorcerer the warlord so the noise marines become a troops choice; this feels cheesy. The other is no fast attack. The chosen in a rhino will fill this role but it detracts from a more balanced org structure.